July | 2014 | brady, mark a. My daughter was telling me about a young woman who she works with in a Christian bookstore. My daughter informed me the young lady has been there long enough to start understanding the flow of the business. In other words, what needs to be done in the store and when those task should be completed. Instead she continues to ask a lot of questions on things she has been told many times how to do and when to do it. She will approach my daughter and just interrupt even while my daughter is assisting a customer. My daughter had become very frustrated with this individual, and even beginning to wonder how she got through the interview process. My daughter said she was so frustrated she decided to pray about it. After she had shared with God her frustrations she paused, and it was in that moment God gently spoke into my daughter’s spirit, and she heard God say, “I love her.” My daughter said she wept, apologized to God for her attitude, and renewed in her mind to accept the young lady s he works with as she is. She determined to “love” her as God loves her. Everyone was made in the image of God. Everyone has value. Sometimes it is hard to see this truth, but it is there. You may have to dig deeper, get to know them better, but you will find their worth. This kind of effort takes unconditional love, acceptance, and time. It seems as if it is so easy for us to forget just how big God really is. Just how mighty and awesome is his power. In the way we think and talk to him we must make him feel like looking down at his name tag. To see if it still says, “Hello, my name is: God” I think it is in those times God wants to review with us his resume. We limit God, because our minds have limits. For us there is only so much we can do, but not for God. He has no limits. Let him out of the box. Give him the time and freedom to do a work in us, on us, for us, and hopefully through us. Don’t be guilty of putting any kind of limits on God, especially a “time” limit. 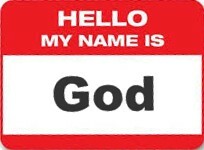 Remember to stay focused on his name tag, for HE IS GOD! Of a similar thought, what would you do “the day before” if you knew? If you knew that tomorrow you get that pink slip, or that positive blood test back, or you’re going to die, or a natural disaster was going to hit. Who would you talk to? What would be so important to you that you just had to take care of it…the day before? Today could be the day before. For me, if my day before was before leaving earth, the day before I am fighting, but the day after I am truly living the way God intended all along. Then I will be living life abundantly. With no more sin, no more hurts, and no more tears. I am looking forward to my day before! At the end of every conversation with my kids I always ask them the same two questions, “Is there anything you want?” and “Is there anything you need?” I have taught them over the years that there is a big difference in the two, and that they don’t always get what they want. As their father who loves them I want to bless them with good gifts, but most certainly want to meet their needs! I want them to have everything they need, and not be in want. “Find me here, And speak to me, I want to feel you, I need to hear you, You are the light, That’s leading me, To the place, Where I find peace again. You are the strength, That keeps me walking, You are the hope, That keeps me trusting, You are the light, To my soul. You are my purpose, You’re everything. How can I stand here with you, And not be moved by you? Would you tell me, How could it be, Any better than this? You calm the storms, And you give me rest. You hold me in your hands, You won’t let me fall. You steal my heart, And you take my breath away, Would you take me in, Take me deeper now.